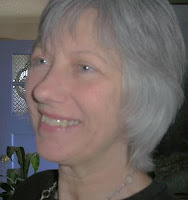 I belong to the Story Circle Network, a writing organization for memoirists. We have an active Yahoo!Group for members, and every weekend chat about books we're currently reading. Recently, we discussed long-time serial authors like Nevada Barr and Sue Grafton, and most of us had strong feelings that their evolving series had become too plot-driven, perhaps even too sensationalized, with a disappointing lack of deep character development. I'm really ready for Kinsey Milhone to have a serious love relationship, aren't you? Anna Pigeon could have spent a little time with her new husband after she got married, but didn't. Call me disappointed and a little unwilling to read the newest book unless I know she'll be spending some time with Paul. One of the things I like most about L.j. Sellers' Detective Wade Jackson character, is that he does develop as a person from novel to novel. It's not just plot-driven writing although the current events issue in each book fuels the fast pace. But we care more about the stories and the series because we gradually care about Jackson. We get to know him as a father, a friend, a lover, and a medical patient. We learn to like him. Susan Wittig Albert shares a few fantastic insights on her blog about just this subject and other challenges in keeping a series fresh. It's a must-read for writers. What hints do all you series writers have for developing your characters over the long haul? Do you think things out a few books in advance, or do you just let the character evolve in a more organic manner from novel to novel? Leave us a comment. Dani Greer is a founding member of the Blood-Red Pencil, is finishing up with her last blog book tours class for authors, and is learning how to podcast for Story Circle Network. When she's not weeding through a manuscript, she's weeding her 2-acre garden. As a series reader, I find that the series that continue to grab me have a few things going for them--things which also make the series unweildy for writers to manage, I'm sure. And second, I think longevity in a series also relies in variety, both in characters and in locations. (Probably a slightly different venue helps the writer be more fresh as well?) But because there are secondary characters who grow and become part of the picture, or new love interests, or different coworkers (and not always the hostile kind, although nothing beats a hostile boss in a police procedural) these variations and the plot complications that derive from them are generallly different enough from the past novels in a series to feel fresh. I think a prime example of a long-standing series that has held up to these things is Tony Hillerman. Unless the characters evolve in a series, then why keep reading them? Without that main character who grows it could be a standalone. And after a while, the character who never changes would become boring and predictable. A change in setting is nice, like Susan Wittig Albert's latest book, Wormwood, which took us to a Shaker commmunity, but the character can stay in the same town as long as we explore something new within that setting. I remember discovering Sue Grafton. I bought every book and read them. I enjoyed them, but after 10 or 12, they weren't enough to hold my interest until the next one came out. Not that they weren't good. Clearly they were since I bought a bunch. Kinsey Mulhone. Best book was the one where she DID have a love interest. I think it was....can't remember but there was a "slag city" in it out in the desert and everything in that book appealed to me. I stopped reading Grafton too because even the plots got boring. The best developed characters, sorry ladies, for me are Harry Bosch (Michael Connelly)and Dave Robicheaux (James Lee Burke). I like Lucas Davenport (John Sandford) but I don't know about growth there. Let's hear some more of your faves and why you continue to read them. I'll do a recap of the most interesting and post a reading list in the future: Our followers recommend. I agree that a little ongoing romance and relationship development really makes the protag more interesting over the long haul. I agree that, without ongoing character development, a series book may as well be a stand alone. Sometimes I think authors become lazy (or too much under deadline pressure) and slot their previous protagonists into new stories and call it a series rather than develop new characters from scratch. If you need help learning how to podcast I can help you with that.